Many who don't believe Bible as the inerrant word of God refuse to accept anything the Bible that explains God, which makes it extremely to address the presence or existence of our God which is within the pages of the Bible. Instead they challenge us to prove God's existence without the assistance of our Bible. At first glance this seems to be a foolproof way to silence Christians, as we depend so much on God's word to help us. We can deal with people who try to discredit the Bible with the backing of archeologist and historians who all agree with the veracity of the Bible. However take away our primary source book we seem to falter. So the gauntlet has been thrown and the challenge made. So do we accept? I, who have seen science to be in 100% agreement with the Bible, hereby accept the challenge and will hereby strive to prove God's existence with the laws of science and physics ONLY. In this study, I will not revisit evolution's flaws as I have already addressed its unscientificness already in a previous study. Rather we will focus upon the beginning of time and the universe. 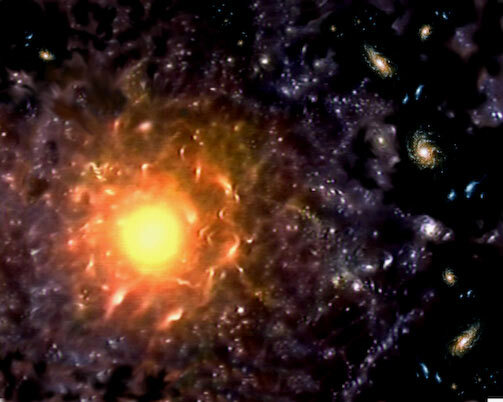 Yes we will explore the science behind the Big Bang. Why? Because according to science, it was from the Big Bang that all matter, energy, and all the complexity of the cosmos started. In a system where no external forces are present, every action force is always opposed by an equal and opposite reaction force. We know ALL these laws apply to the universe at the beginning because the universe even to this date is counted as a closed system. Of course there are many more laws of physics & science(c) but we know in order for a law to stay a law it can at no time conflict with any other law in existence. 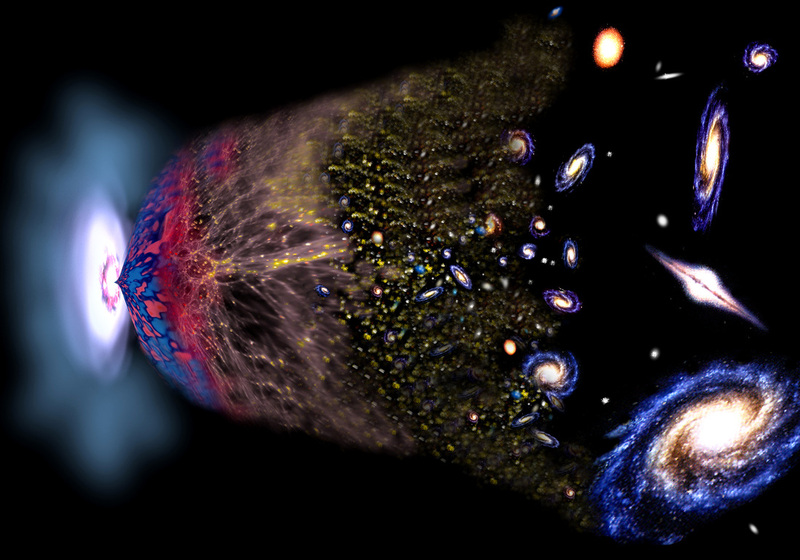 According to the Big Bang theory, by definition, NOTHING existed prior to the beginning.. Then out of the nothingness a tiny speck, which was a spinning singularity, dubbed by many as the Cosmic Egg. The singularity exploded and over billions and trillions of years the gravity of the dust and gases slowly attracted one another to create stars and galaxies and planets, that are to this day still expanding outward from that initial explosion. Right from the get go, problems begin showing themselves. If the universe is a closed system, which it is, and there is nothing in existence at this point, then according to the law of Conservation of mass-energy, as stated above, the universe should remain as nothing, for all time. The only time this would change and something would come out of nothing is if by Newton's 3rd law, an outside force affected change upon the universe and added matter to it. Why all of a sudden out of the nothingness was there this singularity? Where did the singularity come from? The problems do not stop there at the beginning either. With the singularity, it is technically still at equilibrium meaning with no new matter and energy being applied to it within this "closed system" of the universe, it should stay that way indefinitely as well. It apparently didn't because according to the Big Bang theory the singularity exploded. This explosion indicates that the amount of matter/energy has increased. For up until this point the amount of matter was completely stable. It's repelling forces and attracting forces were at exact equilibrium. But the explosion shows that the repelling force had become greater overcoming its force of attraction, that was keeping it together. Where did this new matter come from to tip the repelling force to be greater than the gravitational force? According to Newton's law of motion, as long as there is no outside force the opposing forces should remain in equilibrium and stay as a singularity indefinitely. What was this outside force? Despite atheist's and agnostic's desire to avoid admitting there might be a God, that is the only logical explanation for the physics and science behind the Big Bang. What other explanation satisfies both laws requirement for someone outside the normal universe to have added energy or matter that was unnatural to the nothingness state of the universe? This obviously leads to a more important question for every single human. That is: If there is a God that created everything, including me, do I have to one day stand before Him and give an account of my life to Him? The answer is yes and this is where the Bible comes in. According to this God who made everything, we all are sinners who rebel against his natural and morale laws, which he has placed within every one of us humans. Fortunately for all of us, God didn't just leave us as sinners worthy of Hell because of our thoughts, intents, motives, and deeds. Rather He made a way by having His own Son Christ Jesus pay our punishment for us and instead offers us life eternal with Him and His marvelous creations of the universe, as a free gift. All God wants us to do is accept it by believing in Jesus. You can start by saying this prayer.